In anaerobic digestion different feed stocks have different methane production potential or different energy recovery value. The biogas generating potential of any feed stock or feed stocks blend can be predicted through a lab based approach, commonly known as Biochemical Methane Potential (BMP) Assay. BMP assay is an efficient and economic method for estimating of biomass conversion and biogas yield potential of any feed stock or feed stocks blend. It was first established by Owen et al. (1979). In that scientific paper they explain the BMP assay method as well as how result can be explained and used for predicting anaerobic digestion performance. In general, The BMP assay is conducted by combining a single feedstock or feedstocks blend, inoculums, and stock solutions in a closed assay bottle for a batch system mood. The bottle should be flashed with nitrogen gas to maintain anaerobic environment and closed with a septum for the convenience of gas collection via syringe. Inoculums are an active anaerobic culture added to the bottle to reduce any lag time and initiate the digestion process immediately. Stock solutions are mixture of macronutrients, micronutrients, and vitamins to assure that biogas production are not limited during the assay. A water bath can be used for temperature control and a shaker can be used for mixing the solutions. BMP Assay can be continued for as long as for 60 days and biogas produced can be measured periodically or continuously. 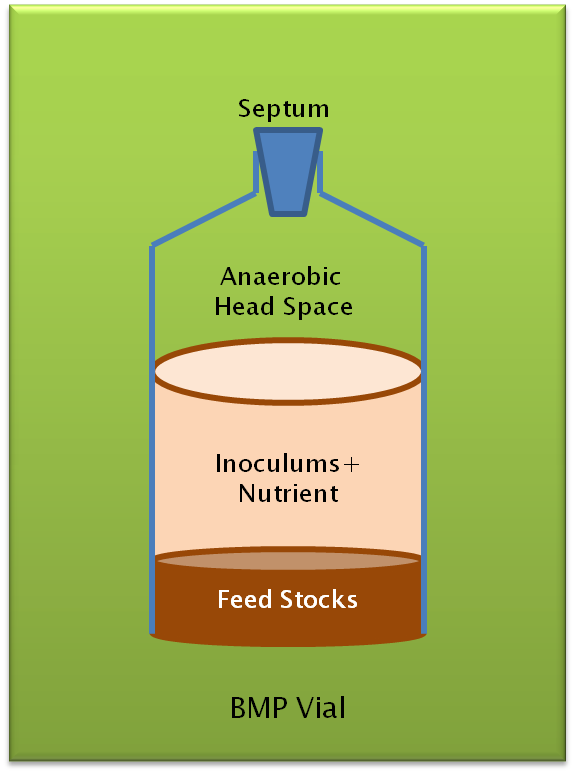 A control solution bottle should also use containing inoculums and stock solutions to determine gas production from the inoculums alone. BMP assay should always be conducted in replication to assure the duplicability of the test results. Before and After Feedstocks Characteristics: The feedstocks characteristics like pH, chemical oxygen demand (COD), total solids (TS), and volatile solids (VS) are checked before and after the BMP assays. The before assay results help to determine the feedstock quantity required for maintaining the assay for as long as 30 to 60 days. The after assay feedstocks characteristics reveal organic material destruction and biodegradability of the feedstocks during the assay. Total biogas production and gas composition: Total gas production can be measured during the BMP test either by collecting it manually or by continuously using commercially available gas meters and softwares. Later biogas composition can be analyzed by a gas chromatograph that is set to determine the concentrations of methane, carbon dioxide, nitrogen, and hydrogen sulfide gases. It is suggested that BMP results should also be verified at a bench and pilot scale level. It is strongly recommended that full scale anaerobic digestion designs should not be based on BMP results as full scale digesters are often run at continuous mode while BMP tests are at batch mode (http://www.extension.org/pages/26617/feedstocks-for-biogas).